My '08 (base C6 bought new - battery in engine compartment) is running on the original Delco battery. I don't want to chance going any longer on the battery. I would like to change to an AGM battery. 1. Would you recommend AC Delco or Optima Yellow ? 2. What is the product code for your recommendation ? 3. Are there any issues with agm batteries on the C6 i.e. longevity, lots of sitting time problems, any special battery tender to use ( I currently use a C-TEK 3300), etc. ? Optima Red Top. Yellow is for marine use. I've been running a red top since 2015, AZ heat hasn't killed it yet. Thanks Corvette Ed. What is the Red Top model number for the C6? Sorry, but I don't know that right off hand. Any parts store you purchase one from should be able to look up the correct part number up for you. I will say that I've had mine for two years, and I've gone as long as four weeks while the car sat in the garage without a tender without having any issues with starting the car. Group 35 Optima Red Top. Bought on ebay same price just about anywhere $232.00. Last edited by 2008 Corvette; 11-23-2018 at 05:27 PM. Reason: Price error. Optima's Blue Top is the deep cycle battery for marine & RV use! Yellow Top is for vehicles heavy with accessories! I have had 3 yellow top batteries for my GMC conversion van and they have been awesome for watching movies and playing console games while waiting for & riding the ferries, When the yellow top's price went from $189 to $270 plus, I went with an Interstate battery at Costco, which no longer sells Optimas. Blue top is for marine & RV use! I will be the dissenting voice on Optima Red Tops. They are not a top choice since Johnson Controls bought Optima quite a few years back. I had a bad one in my Avalanche that was replaced under warranty, and the replacement went bad in about 2 years. A simple Google search will reveal they have had more than their fair share of problems. For the record, I used to work for JCI and am familiar with their automotive-related products. I would suggest an Odyssey as a better choice, if they make the correct size. What timing. I just had this conversation with the Owner of the shop I use for everything not under warranty. He told me what a lot of people say here that since Optima was bough they went to junk. He says he only recommends AC Delco and would suggest the AC Delco AGM.battery. If you really want to use Optima, then choose between the RED top, max starting and Yellow top a more deep cycle. I have had mine now for about 6 years and when I bought it it already had a Yellow top in it. Still doing great. In fact, it can sit for several weeks and still starts right up. Since your original Delco battery lasted 10 years, not sure why you’re looking elsewhere. During my c5 ownership I too was not impressed by the Red Top. Advantage of the OEM Delco is it fits exactly. So many threads on this; noting there are the three manufactories (I recall) of all batteries including Johnson Controls. Ease of warranty (Napa Auto Parts for example) could be a consideration. There are choices with more CCA than the OEM spec, which could be desirable. I have had excellent performance with both red and yellow tops. I think at this point I'm going to keep my C6 as much GM as possible. Delco AGM it is. Does anyone have a GM p/n? No brainer. Why even ask? Last edited by Vet Interested; 11-24-2018 at 04:47 PM. I run the Yellow top - it’s for high drain conditions and heavy vibration conditions. My Corvette presents both due to mods. I bought an Optima Yellow top to replace the original, which died at 39 months. My '07 vert Red has been my daily driver for the 140,000 miles and I'm on my third Yellow top. Not that there's anything at all wrong with the Red top. As with any battery (AGM or not) that isn't designed for deep discharge, it will lose about 10% of its charge capacity (rule of thumb) every time it goes down far enough to require a jump. My Red rarely sits untouched for 2+ weeks. But it has discharged completely more than once, especially during the first year. With an AGM battery designed for deep discharge like the Yellow top I never have to worry about this. Far more than brand or construction type, the leading cause of premature battery failure is high ambient temperature. For years Corvette owners along the Gulf coast (especially in south Texas and Florida) have reported battery failures in as little as 24 months. This is a problem for all brands, even if the car is driven every day and not stored 5-6 months a year. 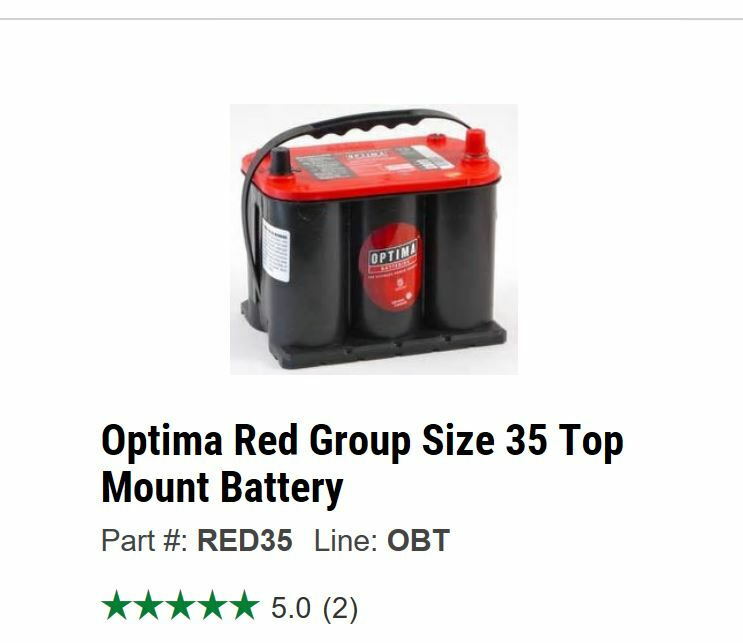 Incidentally, there is a Battery Tender model they claim is designed especially for AGM batteries. But if you already have a tender, it will work fine with any battery. Last edited by Eritosthenes; 11-24-2018 at 10:11 PM. My thoughts, exactly. Is the Optima going to last 20?